Chiharu Shiota, ‘other side’ (detail), Installation at Towner, 2013. Chiharu Shiota (b. Osaka, 1972) is a Berlin based artist working across media, including painting, performance, video and installation. In the mid-1990s Shiota moved to Germany where she worked with Marina Abramovi? at the Hochschule für Bildende Künste in Braunschweig and then at the Universität der Künste in Berlin. Her work has been widely exhibited around the world, and shows in the United Kingdom include ‘Walking in my Mind’ at the Hayward Gallery (London) in 2009. 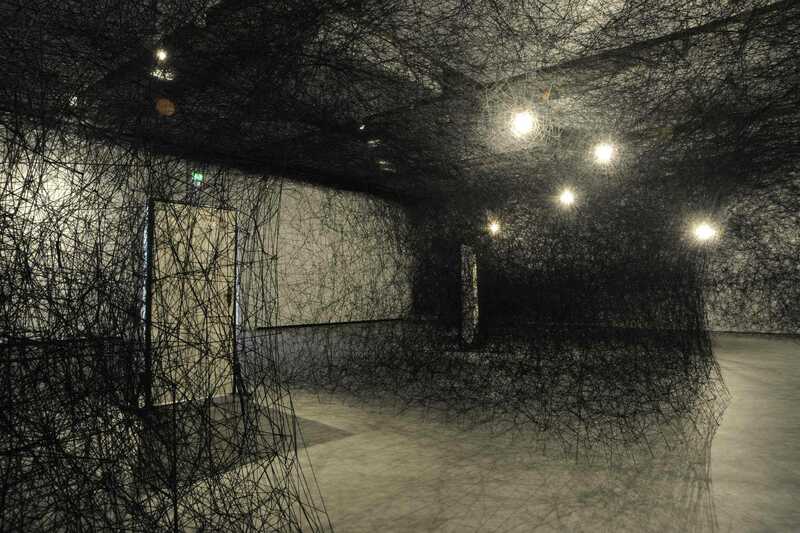 Shiota’s current exhibition in the UK has been commissioned by Towner, the contemporary art museum for South East England. Titled ‘other side’, it has been curated by Sanna Moore (Exhibitions curator at Towner). A well-illustrated catalogue has been published alongside the show with an essay by the curator and writer David Elliott. 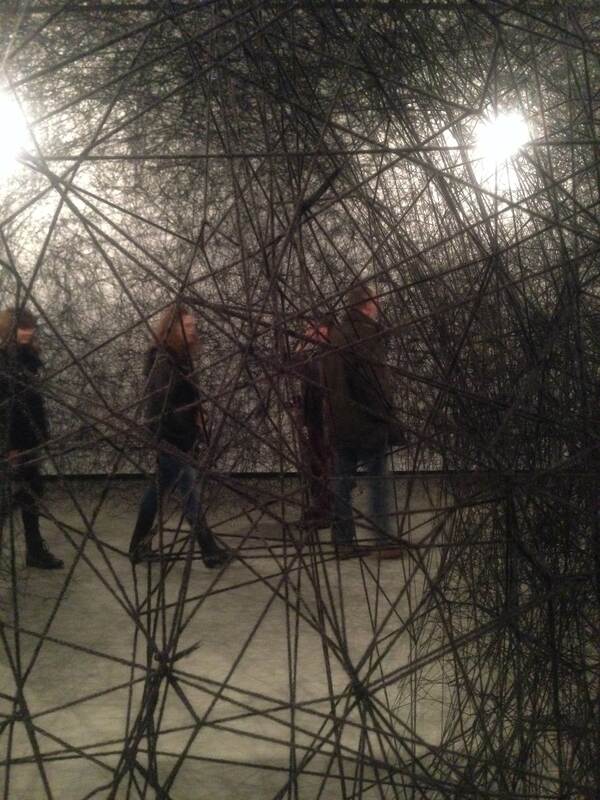 ‘Chiharu Shiota: other side’ runs through to 5 January 2014. Towner, Devonshire Park, College Road, Eastbourne BN21 4JJ (Tues-Sun 10am- 5pm). Closed Christmas public holidays. Also open 10am-5pm Bank Holiday Mondays www.townereastbourne.org.uk. ‘other side’ expands on Shiota’s exploration of skeins of yarn thread as a medium through which to think about architectural spaces or built environments, and their relation to objects and human figures. 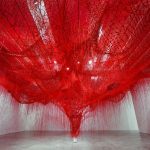 Shiota has created a number of poetic and deeply affecting installations with thousands of metres of yarn, either red or black in colour. Through what is referred to by David Elliott, in the exhibition catalogue, as a ‘painstaking manual process’ objects and spaces are enmeshed in threads that may appear intricately woven (‘During Sleep’, 2002) but also disruptively knotted, tangled or broken (‘The Way into Silence’, 2003). 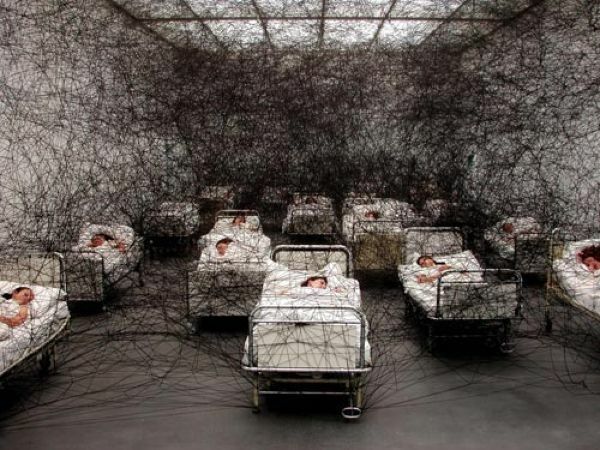 ‘During Sleep’, staged a number of women in white nightdresses asleep in hospital beds: the beds, and the space occupied, enmeshed in the black yarn thread. As with all of Shiota’s work this installation can be interpreted in many ways: I imagine a dialogue with a vast cultural repository to do with sleeping women, illness, fairy-tale and myth. Chiharu Shiota, ‘During Sleep’, 2002, Kunstmuseum Luzern, Lucern. The relationship to memory, processes of remembering and forgetting, is a powerful aspect of Shiota’s work. Memory can be elusive and difficult to grasp. We might feel nostalgic longing for a past long gone or remain trapped in the undesired traumatic collapse of space and time. Numerous objects – either public or private in meaning and use – have been appropriated for Shiota’s thread installations – beds, pianos, doors, chairs, shoes, letters. The exhibition at Towner situates doors, removed from their original frames and sites, in what appears as a dense, labyrinthine, threaded space. Doors suggest not only mundane, everyday acts of opening, closing, or locking but also invoke memories and sensations to do with obstructed entry, sorrowful departures or joyful returns. But the strength of Shiota’s work is that it cannot be pinned down to a singular, absolute meaning: its quality is enigmatic and its importance has as much to do with bodily experience, and the things we sense and feel, as it does with what we claim to objectively see and describe. Chiharu Shiota, ‘other side’ (detail), Installation at Towner, 2013. You return often to the idea of the thread, creating installations that are monumental in scale, with a powerful sense of presence and physicality. What draws you to this material, and can you give us a sense of what it is to work with it as an artist? I don’t feel so much drawn to the material itself, that is, the physical condition, but more to the possibilities it gives me. I first studied painting but soon felt limited by the two dimensionality of the canvas. I started to experiment with how to work in the third dimension and found a way to use thread in order to draw lines in this dimension. That’s also one of the reasons why I often use black thread – it’s like drawing with a pencil. Thread is also a material that speaks very strongly to the literary and the mythological as much as it does to the visual. I’m thinking of how Ariadne helped Theseus through the Labyrinth with a skein of thread. The idea of a labyrinth also suggests physical sensations of being lost, of claustrophobia and so forth. There is this recurring sense of affect and physicality in your work, and the actual experience of it. I see the thread symbolically for human relations. In most of my thread installations, the thread forms a three-dimensional web – in the end everything is connected. A thread can go straight between two points, connecting them. It can also tangle up, like in a complicated relationship between two persons, and it can break. A lot of layers of thread form a dense space, like a night’s sky or the deep universe. This makes some of my installations like a labyrinth and when you enter it, it changes your perception. From the inside of an installation, the outside looks different and the other way round. I like it when people experience that. 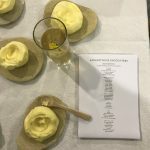 What informed the approach you took to the Towner commission – this is a gallery space that you are working with here. You explore the black thread and also doors. What is interesting to you about the idea of a door? I noticed in an image from the exhibition catalogue that one of the doors is quite visibly worn and peeling, which again speaks to things that are about affect, physical sensations, or memories? Domestic interiors and private spaces appear to be a theme in your work? Living in Berlin as someone who is Japanese, I am living between two cultures and am therefore fascinated with frontiers. Before working with doors, I worked with windows. Both doors and windows are always a border between two spaces and when you pass through them you are in a different environment, in a different world. The other side always looks different, the outside differs from the inside. When I go back to Japan it always turns out to be different from how I imagined it back in Germany. The doors in the installation at Towner – just like the windows I am using in other installations – come from old houses in East Berlin. Every door has a different story; each was present in different households. I like the stories and memories behind objects and try to conserve them by weaving around them. 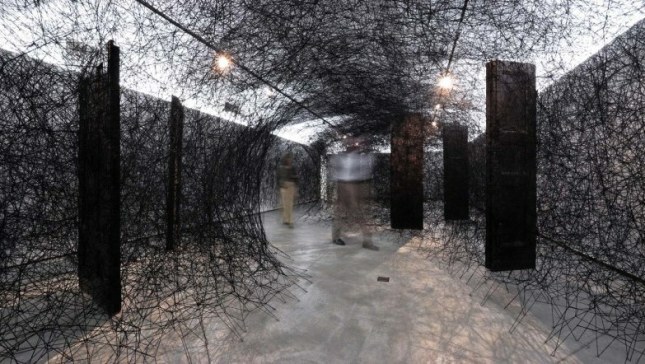 Chiharu Shiota, ‘Dialogue from DNA’, installation in Berlin, 2008. Photograph: John Macdougall/AFP/Getty Images. Your work as whole seems to explore themes that are quite elemental and intimately related to the human experience. Black and red are such elemental, symbolic colours, and I wonder about their recurrence in your work, not only in the thread works. There are also references to blood in installations and videos. The red thread makes me think of familial ties, and blood. I think of black as a very neutral colour. Several layers of black thread give space a depth that I like. Red on the other hand is connected to blood and blood ties – family, origin, things that are natural to a person, embedded in culture. Your work refers a lot to the absence of bodies, those that were once there but are no longer. Objects and forms, in your work, speak to bodily presences or the memories of bodies? You appropriate worn shoes, for example. Presence in the midst of absence is the main subject of my work. I’m fascinated by things and places where you can sense what has been there despite the fact that it’s long gone. I work with used clothes, suitcases, and many other objects that carry memories inside (although most of the time I don’t know the stories behind them). The memories make those things interesting, just like with humans. Memories are also fascinating because they are intangible – they exist, but it’s impossible to get to the evidence of their existence. Chiharu Shiota, ‘in silence’ (detail). Installation for Art Basel, 2013. Performance is also an aspect of your work, and this is important, I think, for the very physical sense that it communicates. Performance is, for me, a way to work with my own body – with which I make sure I exist. My performances have a rather ceremonial character and I don’t do them for show. That’s why it doesn’t matter whether there’s an audience or not and in the past few years, I’ve preferred to do them without one. 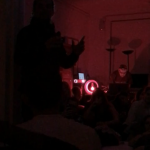 Those performances are recorded and now exist as video works. You have also used the black thread in stage design. Working with theatre is very interesting for me because it is very different from making an installation. In fact, it’s quite opposed. My work is about absence, but a stage is there for people to perform on. I also usually decide everything about my installations myself. But in theatre you work with a big team and there are different people responsible for different things. This way of working makes me learn to work differently and also see my own work in a different way. 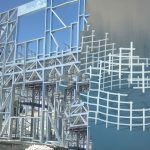 Those projects are very enriching experiences. What is interesting for you about the installation at Towner, and the ways that people have responded to it? I really like the space at Towner because it is one big hall. This was very challenging and presented the possibility of making an installation people can walk in. I don’t want people to have a certain reaction but to experience my installations in a personal way. The reactions differ a lot depending on a person’s background, and their memories, and therefore I don’t get surprised when people respond in different ways. Chiharu Shiota: ‘other side’ closes 5 January 2014 www.townereastbourne.org.uk. For more about Shiota see: www.chiharu-shiota.com. 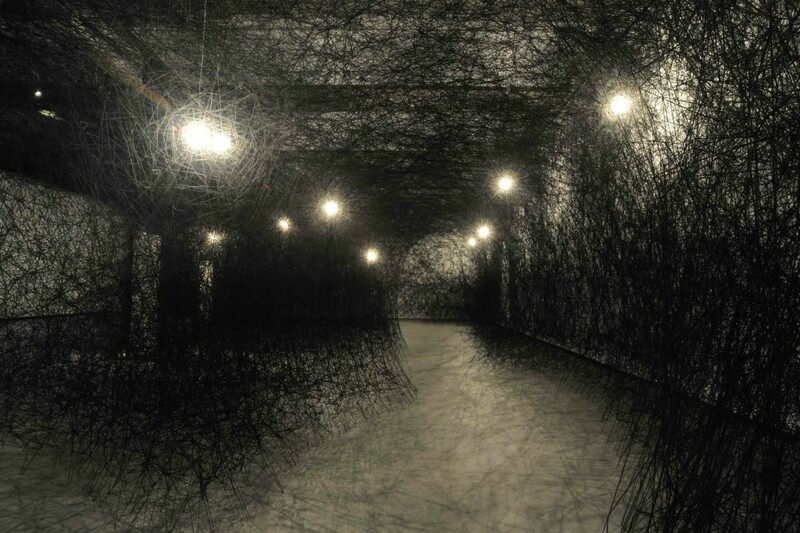 All images courtesy of Chiharu Shiota, 2013. Photographs of the Towner installation are by Alison Bettles. This entry was posted in INTERVIEWS and tagged Chiharu Shiota, Chiharu Shiota: other side, Installation, Sanna Moore, Towner. Bookmark the permalink.